Bright medi-weld appliances excels in rendering a qualitative gamut of ultrasonic thickness meter, which is offered to the clients at leading market prices. The devices are highly appreciated by workers, engineers, professionals, students, researchers, govt. Agencies etc. We have a range of latest engineering tools which are simple to use, less time consuming, accurate & suits your application. 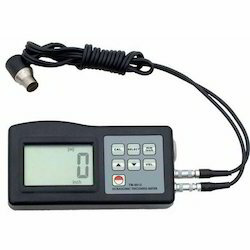 TT100 is a hand held microprocessor controlled thickness gauge specifically designed for measuring the thickness of metallic and non-metallic materials e.g. aluminium, titanium, plastics, ceramics, glass and other good ultrasonic wave-conducting as long as the material has parallel top and bottom surfaces. With uses in many areas of industry TT100 can perform precise measurements on various types of raw materials, components parts, and assembled machinery. It can also be used to monitor all types of pipes and pressure vessels for loss of thickness due to corrosion. 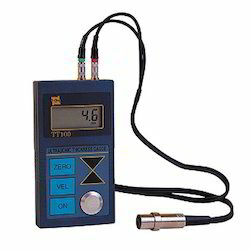 TT100 is very easy to use, after a simple calibration to a known thickness or sound velocity, the gauge will give fast and accurate readings in millimetres. Sound velocities for 5 different materials can be pre-set and 10 thickness readings can be stored in the memory. RATES SUBJECT TO CHANGE WITHOUT PRIOR NOTICE DUE TO DOLLAR RATES. MAIL US ON for more details. 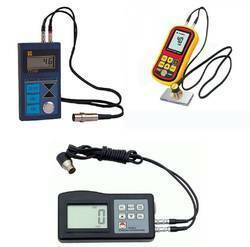 Looking for Ultrasonic Thickness Meter ?